Whether you want to take part in exciting sports or take the time to sit and watch the world go by while all the time surrounded by the most spectacular and varied scenery you will find it here in Fort William … .the choice is yours to enjoy! Just past the ruins of Old Inverlochy Castle and to the west of Fort William is the picturesque Road to the Isles. Whether you chose to travel the route by car or train you will be able to enjoy some spectacular scenery. Along the way there are many points of interest… Neptune’s Staircase on the Caledonian Canal, past Loch Eil towards historical Glenfinnan with its stories of Bonnie Prince Charlie and the Jacobites or Harry Potter and the Hogwarts Express! Further west you will travel above Loch Ailort, where you get your first glimpse of the lovely Hebridean islands through Arisaig and on to the famous white sands of Morar to your journey’s end … Mallaig. 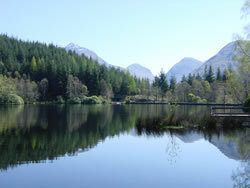 There are many places to stop and enjoy the peace and tranquillity of this remote beautiful part of Lochaber. Mallaig is the starting point for ferries to the small Isles and romantic Skye. Nevis Range has developed into one of Scotland’s most varied outdoor facilities. Paragliding, hand-gliding, mountain biking and winter climbing all complement the ski-ing. 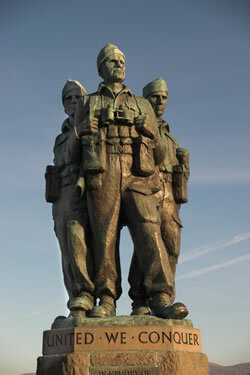 The Commando Memorial is a short drive from Fort William. Located in moorland beside the A82, 1¼ miles northwest of Spean Bridge, this memorial commemorates the elite force known as the Commandos which were set up during the Second World War. Their stories can be discovered at the Commando Exhibition within the Spean Bridge Hotel. The exhibition is open throughout the summer. There is also a Commando Trail which takes in many of the locations used during their training. Driving west along the B8004 will take you towards Gairlochy. After crossing the Caledonian Canal and by joining the single track road you can then head towards Loch Arkaig. This is a long, deep and mysterious loch stretching west through the mountains. At the east end of Loch Arkaig you will come across the spectacular Cia-Aig Falls. Best views are available if you take the short path up from the car park. The road continues along the shore of Loch Arkaig all the way to the head of the loch from where experienced walkers can walk through the glens to Loch Nevis and Knoydart. For centuries this area has been the seat of the Camerons of Lochiel. You can find out all about the Camerons and their involvement with Bonnie Prince Charlie and the Jacobites in the Clan Cameron Museum in the tiny hamlet of Achnacarry. The museum is open daily Easter to mid-October. 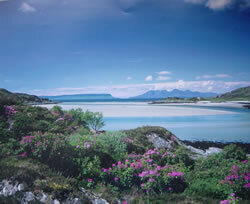 You mustn’t miss the breathtakingly beautiful Ardnamurchan peninsula. Truly a relatively undiscovered piece of Scotland, you can take the single track roads through unrivalled scenery and discover some of the most perfect beaches you will ever see. Take your time; watch the wildlife, eagles, seals, pine martens and deer are often seen in close proximity to the road as it winds along the shore. 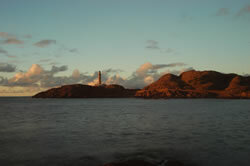 While you are there, why not take the single track road through Kilchoan to visit the lighthouse at Ardnamurchan Point. While reaching this most westerly outpost of mainland Scotland takes effort, being there is worth every ounce of it. West Ardnamurchan is a wild, lonely, and stunningly beautiful place. At the heart of the Great Glen, the Caledonian Canal offers visitors spectacular scenery and amazing wildlife … including the Loch Ness Monster! The most impressive single engineering feat on the Canal lies north of Fort William, where you will see Neptunes’s Staircase signposted off the A830 Mallaig road at Banavie. Neptune’s Staircase is a ladder of eight locks that raises vessels to a height of 70 feet above sea level over a distance of 500 yards. There is another ladder at Fort Augustus which lowers the vessels to the level of Loch Ness. There are many ways to see and enjoy the Caledonian Canal, including sailing along all or parts of it or how about walking the 73 miles of the Great Glen Way! This is Scotland's fourth National Long Distance Walking Route and runs from Fort William to the Inverness. 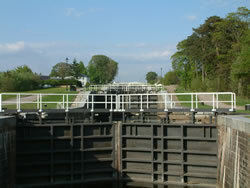 The route closely follows the line of the Caledonian Canal. Also on site is a shop selling a range of gemstones, crystals and jewellery. Glen Nevis is very close to Fort William as you travel north on the A82. To many, the marker at Nevis Bridge at the beginning of Glen is the welcome end of a strenuous and magnificent 95 mile walk from Milngavie on the outskirts of Glasgow, called the West Highland Way. There are some delightful walks in the Glen to suit all grades of fitness, perhaps an easy stroll along the riverside, through the Gorge at the head of the Glen or climbing ‘The Ben’. However you go on your way through this most beautiful of highland glens you will see some spectacular views and if you’re lucky catch a glimpse or two of the local highland cattle – they are always worth a photo! The Lower Falls are the first real show of power the river can offer and during a wet period they are extremely impressive as the river cascades and tumbles down on its way to the sea. Hard to believe then that some hardy enthusiasts negotiate the river (including the falls) using only Lilos (airbeds) during the Glen Nevis River Race! 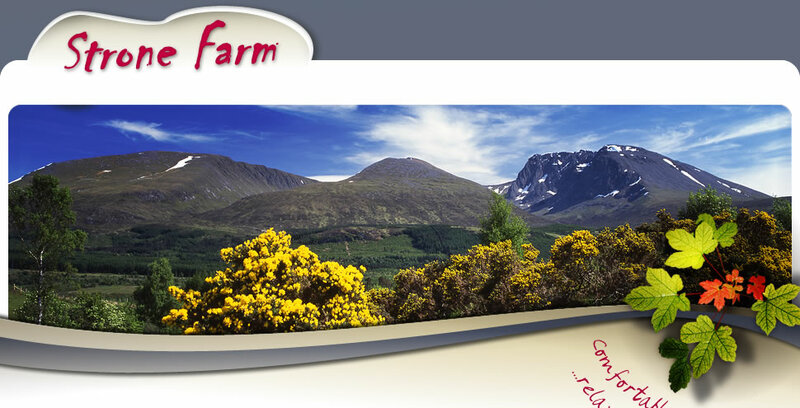 This is an annual fundraiser on behalf of the Lochaber Mountain Rescue. 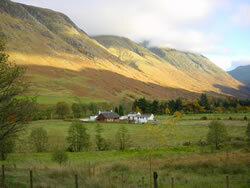 The Glen Nevis Visitor Centre (Ionad Nibheis) is the starting point for people preparing to climb Ben Nevis. It is visited by over 80,000 people each year. As well as being the base for the Highland Council’s Ranger service, the Centre displays interesting historical, geological and geographical exhibitions and stocks a wide range of maps and essentials for walking in the outdoors whatever the weather. At 4406 feet / 1344 metres Ben Nevis is the highest mountain in Britain. It is also one of the most popular with tens of thousands of walkers taking the ‘tourist’ path to the top each year. The path starts in Glen Nevis – at Achintee Farm on the north side of the river or alternatively at the Youth Hostel. If you decide to join the throng, remember that this is a serious undertaking and dress for the mountain and not the glen – it is usually cold and windy and often wet up there!